Compkart Australia has experienced a winning feeling at the first round of the 2016 Rotax Pro Tour National Series at the traditional season opening at Melbourne’s Todd Road circuit with two overall victories in DD2 and DD2 Masters and a further two podium results, kick-starting the team’s rebirth at the top level of Karting in Australia ahead of a big 2016 season. Competing as part of the CC Racing alliance, multiple Team Australia representative Troy Woolston experienced a mixed start to his weekend, qualifying 16th in the wet weather with a 52.579 however from there, Woolston went ahead in leaps and bounds. Finishing as high as fifth in heat one, Troy achieved eighth and sixth in heat two and three. With the conditions improving for Sunday’s pre-final, Woolston set about making a strong start to his points tally for the season, engaging in a hard fought battle amongst the top four. Setting his quickest time on the penultimate lap, the Victorian finished third, handing him a second row start for the final. Delivering an array of blistering times in the weekend’s longest race, his quickest came with a 40.119 on lap 20 before taking a comfortable 3.4 second win. The Todd Road event marked the first for Joshua Car in DD2, qualifying an impressive seventh, Car finished ninth in heat one before completing Saturday with a DNF and a 16th place result. Running amongst the mid-pack for much of the pre-final, Joshua managed to achieve the fastest overall lap of the race with a 41.289, finishing 16th, however a DNF on lap one of the final would bring about a premature end to his first weekend in the class. Making the transition from DD2 to DD2 Masters, Australian V8 Ute Series regular and Z-Corse driver, Kris Walton qualified 23rd to start his first weekend in the class for drivers aged over 32. This however acted as a springboard with Walton moving up to take second in heat one, fifth in heat two and fourth in heat three, improving his starting position for the finals dramatically. Taking 12th in the pre-final, Kris delivered a display of driving that was nothing short of impressive, taking the win by 1.4 seconds, on his way to the victory, collecting the quickest time of the race with a 40.584. Walton’s Z Corse team mate, Scott Simpson had a mixed weekend in his first event in the class, qualifying 24th, Simpson finished sixth in heat one before taking 20th in heat two and a DNF in heat three. The weekend ended in an unfortunate manner for Scott with a DNF in both the pre-final and final. 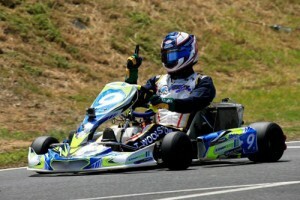 On the back of his first ever appearance for Team Australia in 2015, Queenslander Scott Howard for Pacific Kartsport started his new season with 15th in qualifying before stepping up to take fourth and sixth in heat one and two respectively, however a DNF in heat three would impact his grid position start for the finals. Setting his quickest time on the penultimate lap in greasy conditions, Howard finished 16th in the pre-final before making a rapid progression in the final, taking a comfortable fourth place and podium to start the year. Dean Wanless began his season with 16th in qualifying with an 18th, 21st and 17th in the three heat races. Wanless unfortunately recorded a DNF in the pre-final however took advantage of the longer distance final, moving through to take 15th. 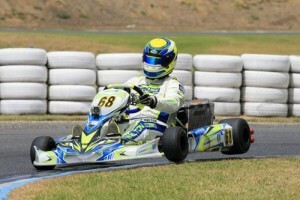 Former Australian Rotax Light National Champion Brad Jenner had an unfortunate beginning to his Rotax Pro Tour season, experiencing a flat tyre in qualifying, recording the 24th quickest time. Despite a DNF in heat one, Jenner finished ninth and eleventh in heat two and three respectively. In drying conditions in the pre-final. Brad worked his way up the order with early race pace to finish fourth. The result was then further improved upon, picking up third in the final and securing a good bank of points to start the race season. Stepping up from Junior Max, Jye Hopkins qualified 34th with 27th in heat two and a DNF in heat one and three. The longer races for Hopkins proved more successful, with 28th in the pre-final and 18th in the final. Luke Wanless was the first of two Junior Max drivers for Compkart Australia, qualifying 29th he went on to finish 26th, 22nd and 24th in the three heat races however his weekend was ended early with two DNF results in the pre-final and final. Lewis Hodgson made his first appearance in the open Junior Max class after featuring in the Trophy category, managing to achieve 20th, 18th and 29th in the three heat races. The next major event for Compkart Australia is round one of the 2016 Australian Kart Championship that takes place at the Lincoln County Raceway, Dubbo, NSW from February 5-7.